Charlemagne (GB) Your browser does not support any audio element. After the death of Pippin III. 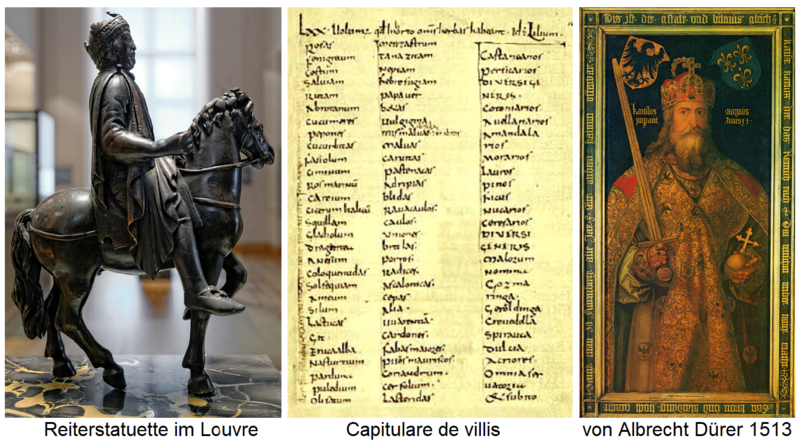 the short (714-768) shared his sons Karlmann (751-771) and Charles (742-814) the throne. After the early death of his brother, Charles became the sole ruler of the Frankish kingdom in 771. In numerous battles he extended his empire as the largest since the Roman Empire over today France. Belgium. Germany. Austria and the Switzerland and laid the foundation for a Christian Occident. At Christmas of the year 800, he settled by Pope Leo III. (750-816) in Rome to crown the Roman Emperor. In addition to trade, commerce and agriculture, he promoted cultural development and the sciences and also created a comprehensive, legal order with, among other things wine law Matters. In addition, he promoted by numerous laws and donations of vineyards and viticulture, of which numerous documents testify mostly to monasteries or orders in more than 50 places. The "Capitulare de villis vel curtis imperii Caroli Magni", issued by him in 812, governs, inter alia, three - field agriculture, fruit care, the breeding of cattle and the viniculture regulated. Included are strict provisions regarding hygiene in the winemaking with the ban, the grapes with your feet too stamp or to keep the wines in animal skins, as well as bids for the use of barrels with iron rings and that each vine three to four "coronas de racemis" (ironworks or Bogreben should have). Furthermore, he allegedly granted the winegrowers the right to cook even pressed wine and display this through a green bouquet (bushes) above the front door. This is true in many sources as the "birth" of Buschenschank, In the Capitulare itself or in other original sources this fact is not mentioned and therefore unsecured. The dense forests in the Rhine plain were cleared on Karl's orders and with vines out Hungary. Italy. Spain, Lorraine and the Champagne planted. It was the selection quality full varieties paid great attention to the "good Frankish Varieties were separated from the "bad hunnic varieties". Whether the "hunnisch" already at that time on the grape variety Heunisch ( Gouais blanc ), is rather doubtful, but not impossible. Also in determining the best vineyard locations, the emperor allegedly took influence. He watched him on a boat trip on the Rhine to his Palatinate in Ingelheim ( Rheinhessen ) that on the slopes of the Rüdesheimer Berges the snow first melted and then ordered to plant a vineyard here and with vines out Orleans to plant. Maybe it was the revived grape variety. However, it is not certain which spot exactly it was, because the famous Rheingauer Lagen Steinberg and Johannisberg emerged much later. A similar story is going on over the Corton mountain Burgundy he also recognized as a good location. In 775 he donated the upper part of the slope of the abbey of Saulieu, which named in his honor the white wine Corton-Charlemagne pressed there. His name is in the community Aloxe-Corton even today. Charlemagne was a moderate drinker and detested drunkenness. He remarked: "Only he who loves moderation is a true friend of wine" . In public banquets, he should have drunk no more than three times over table, that is, not more than three trophies. Supposedly he especially loved the muscatel, To his favorite wines counted the red wine Cornas on the middle Rhône. Supposedly he drank but then in old age dear White wine, there red wine unwanted, his white beard dyed. The monarch named the twelve months of the year in his mother tongue and gave October the name "Windume Manoth" (month of the year) vintage ). In his time, the production of beer on a larger scale. This page was last modified at 10 September 2018 at 09:25.